One of my favorite all-time quotations is from Mahatma Gandhi. He famously said, "You must be the change you want to see in the world." Those are powerful words, but more than that, they're inspiring. Although Gandhi was likely focused on social change, the concept lends itself well to technology as well. Any programming skills I've learned through the years are due to a need or desire for something to exist that didn't previously exist. And if you're considering programming, Linux is an excellent platform to start with. Reuven M. Lerner kicks things off with an incredible how-to article on starting out in programming. The thing about Reuven's advice is that it comes with experience and wisdom. My first (non-bash) programming was done with PHP, but that was only because I started by modifying something that already existed. Reuven has some great reasoning for what he recommends, and it's worth considering. I am certainly doing so! Following up on last issue's song-finding script, Dave Taylor goes further and teaches how to do some pretty significant text manipulation from inside the song lyrics themselves. Even if you're not a hard-core Beatles fan, the process is really useful if you need to gather and analyze a bunch of text. Dave's article is perfect evidence supporting the idea that bash programming is real programming, and shouldn't be underestimated. Kyle Rankin returns to his Sysadmin 101 series this month with some great instruction on patch management. Securing your system is pointless if you don't keep your security patches up to date on your system, yet this seemingly obvious responsibility often is overlooked. This is especially true with software that has been customized, since it requires active maintenance to keep the custom patches up to date. Thankfully, it's something Kyle is familiar with managing, and he shares some invaluable procedures in his column. I decided to visit an old friend this month and write a full-blown article on Plex. I often touch on new features of Plex or tout its awesomeness on the mobile platform from time to time. The thing is, it has become such an integral part of our entire entertainment system (and that of our friends), a complete update seemed appropriate. The Plex world has matured greatly, and it's worth checking out if you're still unhappy with your media streaming technology. 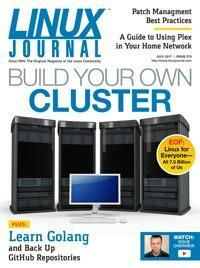 The trio of Nathan R. Vance, Michael L. Poublon and William F. Polik finish their series on building a cluster this month. Their last two articles covered how to set up the various parts of the cluster, including networking and communication between the individual computers. This month, they describe how to use the cluster by configuring various services to take advantage of the cluster you've built if you've been following along. If you haven't been following along, I still encourage you to read this installment, because the implementation of real-world applications might be enough to convince you clustering is a good idea! We finish the issue with Amit Saha showing how to back up GitHub and GitLab repositories using Golang. Although having a public storage area for your code revisions is great, it's not good practice to leave backups to someone else. Amit shows how to make backups so you can have peace of mind regarding your code. Plus, you'll learn to use Golang along the way, which is awesome. Whether you have a desire to learn more about programming, or if you're already an experienced coder, there's always room to learn more. With DevOps being an integral part of what it means to "do" technology, we no longer have the luxury of avoiding development altogether. As an old non-programmer who has always been a bit of a curmudgeon, I can assure you programming can be fun, and its uses for sysadmins are more invaluable than ever. So I encourage you to grab a keyboard, and "be the change you want to see in the world." In a very real sense, we can create the future we want one line of code at a time.